Democratic Party MP Godfrey Farrugia has resorted to the police after he was sent a letter threatening him and his partner to stop undermining Nationalist leader Adrian Delia or else face the same fate as Daphne Caruana Galizia. The letter received on Monday morning. 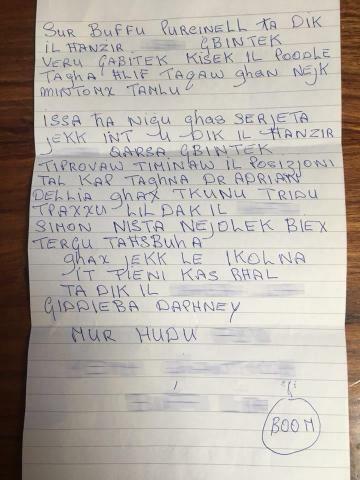 It was not an uncommon postal delivery for Dr Farrugia and his partner and fellow PD MP Marlene Farrugia - except that this time the letter, littered with expletives, bore the sender's Marsa address. "I don't know if it's the sender's actual address, but I have no choice but to relay it to the police. There is a limit." The letter, which claimed to be coming from an Adrian Delia supporter, came after the Farrugias said they would support a no-confidence motion in parliament against the PN leader who they accused of acting like Joseph Muscat’s "poodle" after he had "sung the Prime Minister’s tune" on the Egrant inquiry. The message is clear - stop trying to "appease" former PN leader Simon Busuttil or else Malta will see another case like "that liar" Daphne Caruana Galizia. The hand-written letter incorporates a drawing of a bomb as a parting message. "You can't control insults in this day and age, but what's upsetting is that hardly any politicians condemn such hate messages," Godfrey Farrugia told the Times of Malta. The couple have been targetted ever since they shifted their allegiance from the Labour Party to PD, which fielded candidates on the Forza Nazzjonali electoral ticket last year. The antagonism increased after the Farrugias decided to break ranks with the Nationalist Party when Dr Delia was elected leader. 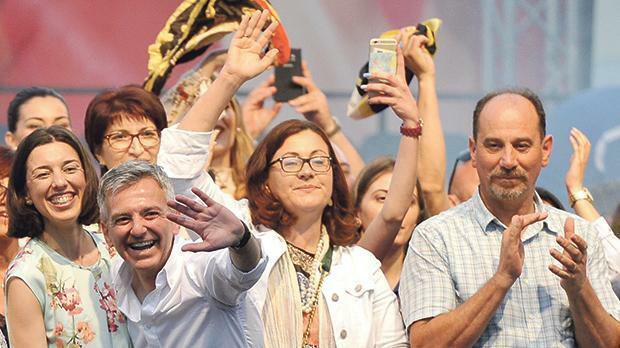 Godfrey Farrugia said, together with his partner, he was at the receiving end of threats in the form of e-mails or posted letters from both Labour and Delia supporters "at least once a fortnight". Marlene and Godfrey Farrugia (third and fourth from left) with Simon Busuttil last year. "I'm used to the insults and the threats but it's also wrong that we get used to them. It's so degrading," he said, pointing out that most of the insults aim at his relationship with his partner. In a Facebook post, PD leader Anthony Buttigieg condemned the threat against anyone who speaks up for the common good. "Disagreeing with someone does not give anyone the right to threaten, bully and cajole them into agreement. Freedom of speech and freedom of association are pillars of our democracy. Any threat to them, be they personal or otherwise, have to be taken very seriously." The Nationalist Party also issued a statement, disassociating itself from the letter and expressing full condemnation.